Like It’s Off the Showroom Floor! The police have filed the accident report. The two drivers have exchanged insurance information, and you’re glad everyone’s okay! But now it’s time to take care of your vehicle. Two questions remain: Who do you know who can fix it? and Who do you trust? NCA Auto Body Repair wants all Hooksett drivers to know there’s an elite team of auto body experts close by. Our smaller facility may be tucked away, but everyone who finds us never forgets their quality service experience. Your vehicle’s fender bender is handled with the same efficiency and expertise as a major collision repair. It’s most important that we serve our customers, and exceed their expectations. We make sure you understand that we’re on Team You! Let us help you get the memory of an unfortunate accident in your rearview. Dings, Dents & Fender Benders–Say Goodbye! Sometimes owners drive around with a dent, dig, or scratch because they think a repair is going to cost an arm and a leg. They think driving around with an imperfect body is an affordable solution. NCA Auto Body Repair wants you to know that we can correct any of your auto imperfections for less. Our intimate facility is large enough, and not so large that we have to pass the expense on to you. 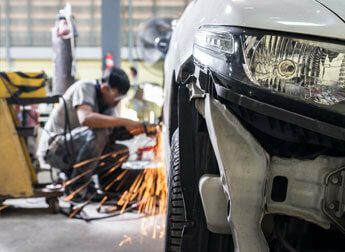 We’ll save you time and money with our superior collision repairs. We can fix your vehicle’s body faster, and we can keep our collision repair services affordable. Stop driving around with a vehicle body that doesn’t match the high-performing engine or the attractive driver behind the wheel. Don’t let time, cost, convenience, or expertise be an obstacle for you, because it’s not for us. Our technicians take care of all of these with every collision repair. Schedule Your Collision Repair Today! Today’s the day that you get your vehicle’s body taken care of! The first step on the path to complete restoration is contacting the collision repair experts at NCA Auto Body Repair in Hooksett. We know how to handle your collision repairs from bumper-to-bumper. Your vehicle is in good hands at our shop, and so are you. Give us a call today at 603-668-1768 to schedule your appointment. We’ll guide you through the whole process and let you know everything our auto body repair services can do for your vehicle. To save some time you can go ahead and schedule your collision repair appointment using our convenient online scheduling system. Next time you’re in the area, feel free to stop by. We gladly accept all walk-ins!